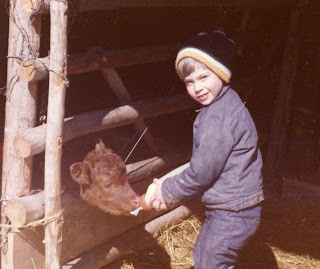 Michael feeding Suzette, an orphan calf. Our kids grew up learning how to take care of animals. Rural kids grow up in an environment quite foreign to that of their city cousins. Children raised on a farm or ranch grow up in a world of long hours and odd schedules, baby calves or lambs in the kitchen (or in the bathtub to thaw out), colostrum in the refrigerator, obstetrical chains hanging on the cupboard door, saddles and bridles in the back hall, syringes on the counter, tractors in the driveway. They grow up sheltered from the “concrete jungle,” yet they're not sheltered from the realities of life. They become intimately acquainted with the facts of life (and death) at a tender age, playing with new kittens in the barn, watching the birth of a calf, seeing life-and-death emergencies in the livestock. There are some new babies that don't survive and tragedies like the death of the favorite mare who died foaling or a heifer trying to have her calf in the ditch. Beloved animals die, become injured, or grow old. Farm kids grow up with the realities of life and death all around them. But as a result they usually grow up to be saner, wiser, more well-rounded adults. The rich experience of growing up on the land, surrounded by life, close to the earth and growing things — the miracle of new life and the naturalness of death — make for a fuller understanding of our own lives and purposes. My husband and I chose ranching because we wanted to raise cattle and horses, but we soon discovered that a ranch is also the best place to raise children. 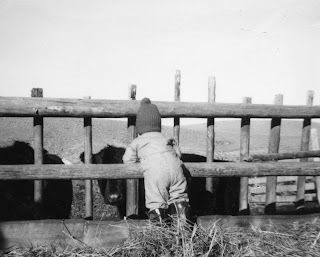 Some of our kids' first memories are of feeding cows. They went along with us as babies because Mama had to drive the jeep. By the time they were 2 or 3 years old, they were “driving” for Daddy by themselves sometimes, standing on the seat and steering — so the Jeep wouldn't head down the hill or into the trees. They couldn't reach the pedals; the only way they could stop the Jeep was to turn off the key. The vehicle crept along in low gear, and when Daddy signaled he was done throwing hay off, the kid shut off the motor. Daddy had a few rough rides when the kids got big enough to try to work the brake and the clutch. Like a cat, he tried always to land on his feet when he lurched off the back, as his young driver popped the clutch. 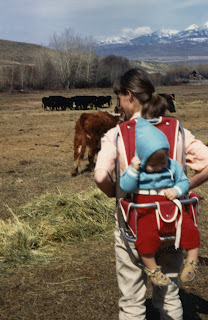 baby carrier on my back, as I was checking cows. When the kids were very small, I took them with me as I did chores or walked through the cows to check on those soon to calve. Our firstborn went everywhere I did, in his baby carrier on my back. Early on, the kids helped with chores, feeding calves, tagging along with us as we did our work, helping dry new calves with towels by the kitchen stove if it was subzero outside. As they got bigger they helped me ride range and move cattle, mounted on a dependable old mare (led from my horse, on their first rides). Michael liked to help Lynn feed the cattle in the corral. They learned how to help shovel ditches and change irrigation water, how to pound staples into fence posts where antelope and deer had knocked the wires off. 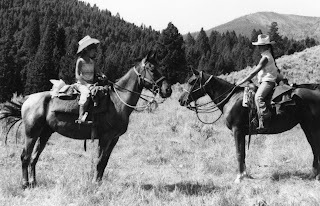 One summer the kids and I put metal stays along 3 miles of fence around our mountain pasture, packing bundles of stays on our horses, tied behind our saddles. They also helped in the house, doing dishes or cooking when I was outside working with cattle. Michael still enjoys cooking and making cakes (he made birthday cupcakes for his daughter to take to kindergarten, when her mama was too busy). 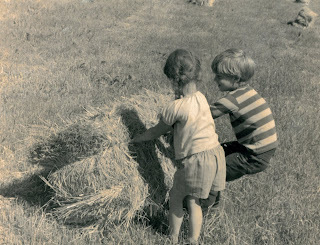 During haying season our kids often rowed bales bigger than they were, to make it easier for Daddy’s stackwagon. The kids had the whole outdoors for their backyard. But it wasn't all work. They played in the creek, making a pond they shared with a tribe of trout that lived under the bridge. They made a playhouse in the barn loft and built houses for their cats. They used the long sprinkler-pipe trailer as a teeter-totter. They had their own secret places and hidden trails through the woods along the creek. There was always something fun to do, with the whole outdoors for their backyard. Rural life brings a variety of jobs and challenges; not all are easy or risk free. A parent has misgivings when a youngster tries an adult job, but if you wait until the child is “big enough,” he may have lost interest. It's better to let the child try something he really wants to do (with careful instruction and adequate supervision). To learn responsibility a child has to try things a little beyond himself, just to prove he can do it. He wants to do it to make you proud of him or to bolster his own confidence. so the stackwagon could pick them up easier. When 10-year-old Michael started baling hay with our new tractor, we held our breath and prayed a little (and Daddy insisted he read the tractor manual first). He was eager to learn and so conscientious that we let him do it. He baled hay the rest of his growing-up years — and enjoyed it — and is now putting up hay on several hundred acres in his own ranching operation. 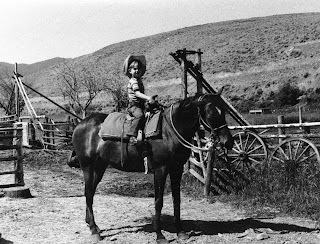 I was apprehensive the first few times I let our 9-year-old daughter go checking range cattle by herself on her flighty young mare, but it was something she wanted to do. She and I would go different directions so we could cover the whole range faster and meet again at a designated spot several hours later. The first summer we did this I worried about what might happen if the mare spooked and Andrea got dumped, but Andrea handled it well, and it gave her confidence. She became a good rider and cow checker. By age 12 she knew all the cattle as well as I did and had an intuitive sense if one was sick and needed to be brought home for doctoring. She was so proud when she and her mare discovered a cow with a bad case of pinkeye on one of their solo range rides and managed to bring the cow and calf home from the mountains all by themselves. The kids both learned to ride on my old mare Khamette. Andrea became a good horse trainer, a good stockman, and an excellent assistant at calving. I could rely on her reports on which cows were in early labor and needed to be brought to the barn. Both kids had cows of their own at a young age. Their first heifers were a set of twins, born when Michael was 9 and Andrea 7. They earned those heifers by helping with chores and ranch work. Their herds expanded as they kept a heifer calf or traded a steer for a heifer; their cows were a way to save money for college. 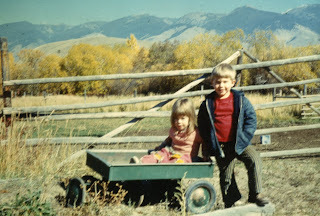 At a young age Michael was fascinated by Lynn's motorcycle and rode along to help irrigate. When he got big enough to do some irrigating by himself, at age 10, he got his own motorbike, with Lynn cosigning the note at the bank. Michael made monthly payments with his summer wages. As the kids grew they shouldered more responsibilities, milking the cow, feeding bulls in the corral, changing sprinkler pipe, irrigating and haying. In summer Andrea and I spent 4 to 8 hours daily riding range, fixing fence, repairing water troughs or moving cattle, while Lynn and Michael did the haying. Both kids helped when we gathered cattle. The kids were able to handle difficult jobs. One spring, when Lynn and I had to be gone for 3 days, the kids (ages 12 and 14) did all the feeding, checking calves twice daily for sickness, writing down breeding dates on the cows. There were few adults I would have trusted with the care of our place during that busy and critical time of year, but the kids did the job thoroughly and conscientiously, and we were proud of them. giving her own mare a day off. Our little ranch is the result of team effort — miles of fence the kids helped build or repair; hay that was fertilized, irrigated and harvested with team effort; the herd of cattle we all helped care for. Today Michael has his own ranching operation, putting to good use the skills he learned growing up. Rural kids get a good background in experiences that are helpful for the rest of their lives. One of the most valuable abilities learned from agriculture is how to apply common sense, practicality, and imagination to problems that come along. You develop the ability to figure things out and make them work. Nothing on a farm or ranch goes just exactly as planned, so you learn flexibility, how to move with the situation and improvise, and how to make quick, valid decisions, often based on lessons learned the hard way. Farm/ranch life fine-tunes our judgment and expands our ability to cope with the unexpected. Rural kids can cope. When an emergency or change of plan arises, they don't give up in frustration or despair; they figure out something to do about it. A ranch or farm is an excellent school for living, and kids that grow up in agriculture have an advantage. Our kids may not have had the cultural advantages available in the city, but they gained a solid foundation in the necessary attributes of confidence, reliability, and a positive outlook on life. And this stands them in good stead, whatever they choose to do.